You are currently browsing the tag archive for the ‘victorian’ tag. This is an adaptation of an original 1890s Criterion Theatre programme in my collection. I confess to being potty about it. The original image is the central strip which I copied, pasted and extended to form a background so that it was a classic card-shaped design. The Art Nouveau shapes and swirls are a treat and enable one to breathe in the theatrical atmosphere of late 19th century London. This small, Grade II* listed theatre in Piccadilly Circus — it has an official capacity of 588 — opened on the site of an old hunting inn, the White Bear, in 1874. It has played host to some notable performances and productions, not least Charles Wyndham as David Garrick (1888), John Gielgud in Musical Chairs (1932), Terence Rattigan’s French Without Tears (1936-1939), Beckett’s Waiting for Godot (1955), which transferred from the Arts Theatre with Peter Woodthorpe, Hugh Burden, Timothy Bateson, and Peter Bull, and Joe Orton’s Loot (1966) with Michael Bates and Kenneth Cranham. Did you know that one has been able to hear the underground rumble of Piccadilly Line trains since 1906 when the station and line originally opened? It gives productions a certain something! To read more about the Criterion’s history, click here. 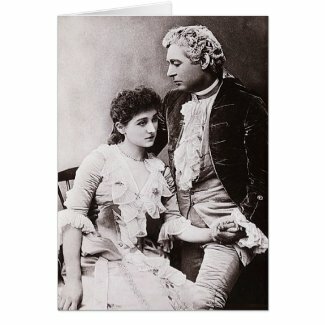 And here are Sir Charles Wyndham (1837-1919) as Garrick and Miss Mary Moore aka Lady Wyndham (1861-1931) as Ada Ingot in David Garrick at the Criterion Theatre in 1886, which is available as a greeting card. I have a mild form of synaesthesia – I’m spelling it the English way — and see days of the week and months of the year in coloured shapes. My fellow blogging synaesthetes include Linda from Country Woman Paints and Benjamin from Expressions of My Life. I dedicate this reblog from The Public Domain Review to the two of you! Grounded in the theory that ideas, emotions, and even events, can manifest as visible auras, Annie Besant and Charles Leadbeater’s Thought-Forms (1901) is an odd and intriguing work. Benjamin Breen explores these “synesthetic” abstractions and asks to what extent they, and the Victorian mysticism of which they were born, influenced the Modernist movement that flourished in the following decades. “I have always considered myself a voice of what I believe to be a greater renaissance — the revolt of the soul against the intellect — now beginning in the world,” wrote William Butler Yeats to his mentor, the Irish nationalist John O’Leary, in 1892. Yeats believed that magic was central not only to his art, but to a dawning epoch when spirituality and technology would march together toward an uncertain future. A change of pace to show you this charming vintage French advertising image, presumably to proclaim the delights of Saint Denis (see top of image), which comes from The Graphics Fairy. I enhanced the original and added the almond green border.